“Jon Stewart is influential in America, so we took the opportunity for the two to meet and to discuss the economy,” Treasury spokesman Steve Adamske said in an e-mail yesterday. Stewart’s program has poked fun at Geithner, including a segment last year about the Treasury secretary’s trouble selling his New York home. On the same day he met with Stewart, Geithner spoke on the phone with Democratic lawmakers including Senate Banking Committee Chairman Christopher Dodd of Connecticut, Senate Majority Leader Harry Reid of Nevada and House Speaker Nancy Pelosi of California, according to the appointments calendar. Geithner also spoke with House Financial Services Committee Chairman Barney Frank of Massachusetts and Senators Charles Schumer of New York and Max Baucus of Montana, all Democrats. The Geithner-Stewart summit-of-sorts was held on a day of some good news for the administration: Labor Department figures for March showed employment figures had improved the most in three years. Geithner the next day announced that Treasury was delaying a report to Congress on whether to accuse China of manipulating its currency. At the time, he was also trying to push the Obama administration’s financial-regulation overhaul through Congress. On April 2, Geithner also visited the Federal Reserve Bank of New York, where he was president for more than five years, and had an on-camera interview in New York with Bloomberg News. Spokesman Steve Albani of the Comedy Central network declined immediate comment on the meeting between Geithner, 49, and the 47-year-old Stewart. 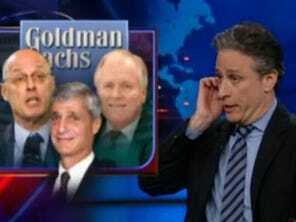 Why Did Tim Geithner Hold An Undisclosed Meeting With Jon Stewart Last April? Joe on Sun, 11/07/2010 - 8:01am.